Flowering takes place in spring, from May to April. Watering should be abundant and frequent. It is convenient to water the plants without wetting the leaves or the flowers. A good technique consists on placing the plant on a plate full with water that should stay during the hottest months, although it is necessary to remove it a couple of days a week so that the plant can rest. We should not use use tap water if this is hard. Soft water is most convenient so that we should pick it up when raining, except in contaminated areas. Leaves should be sprayed from time to time with the type of water previously mentioned and whenever the plant is not in bloom so as not to ruin the flowers. They need an illuminated and well ventilated atmosphere, not directly in the sun, especially in warm climates. Being exposed in demishade is the most appropriate, with a temperature between 12-22ºC. Being not a very warm climate place, it is convenient to protect it indoors during the winter. With the arrival of the spring, they should be placed outdoors again, without exposing it neither to full sun nor to very high light conditions, leaving them in a dark place for 10 days of adaptation. After this period, one can already place them in an illuminated place, nor in full sun. At the beginning of autumn they should be placed indoors. The most appropriate thing is to propagate them from cuttings that will be carried out the last days of spring or the first of summer. So that cuttings root well, they should be introduced for 10 minutes in water in which some drops of plant hormones have been added. They will probably root in about 80 or 90 days. During this whole period they should stay in the shade in a humid and warm place. To maintain the humidity it is convenient to carry out pulverisations with soft water. Concluded the rooting period, they will be planted in a bigger pot with acid soil. One should apply straw mulching to avoid the evaporation. Another way of propagating the plant is by means of seeds that will be planted at the end of autumn. The seeds will be planted at a very little depth and maintained under humid and warm conditions until the new plants attain 7 or 10 cm, moment in that we should transplant them to a new pot. It is convenient to maintain them in this new location during the whole winter. Repotting will be carried out every two years, or in the first one in case the plant has had a very big growth and doesn’t fit well in the pot. When transplanting, mainly in mature samples, the root root will be respected, since such a special radicular system that rhododendrons possess, is very delicate and should not be damaged at all. To incentivate the growth of new flowers, we should remove the dry floral buds, pinching them with the thumb or index, or prune them, fair above the union with the branch, without damaging this. If we try to get a vertical growth lateral branches should be pruned and the plant should be fixed with tutors. In samples specially cultivated to form “little trees”, the inferior branches will be pruned liberating the trunk to attain final aspect little by little. Pruning will be carried out at the end of summer. If we try to create a flower clump, or if we want soil protections, it is convenient to space them at a distance of 1 meter. Although they combine very well as undergrowth plants, we should avoid planting them under trees having a superficial roots that would end up removing them the necessary humidity. They prefer very rich organic soils, acid, with a pH between 4.5 – 5.5 and with a good drainage. It is convenient to fertiliser it every two weeks during blooming. Use a liquid acid plant fertilisers. It should not be done in summer or after repotting the plant in spring. We should wait until autumn to fertilise it again. Rust: Caused by fungi of genera Puccinia and Melampsora. The main reason is due to water stagnation and lack of ventilation. We should take off the affected parts, to improve the ventilation and spray them with an appropriate fungicide. Powdery mildew: It develops on the leaves in the form of white layer that deteriorates the leaves that become yellowish. This is caused by fungi of the species Sphaerotheca, Uncinata or Oidium. The affected parts should be eliminated and spray the plant with an appropriate fungicide. Thrips: They are sucking insects that attack the floral buds, absorbing the sap. The flowers when opening up present white stains and colour fading in general. It is necessary to avoid having the plants in dry and warm places. Bud plague: caused by fungus Pycnostysanus azaleae. The transmitter of this illness is the grasshopper Graphocephala fennahi, an insect with a green and orange tail of about 6 mm, characterised to give big jumps when they touched. These animals should be eliminated with the appropriate insecticide and wipe out buds. Gull of Azalea indica: They affect to the Rhododendron simsi, caused in the leaves by the fungus Exobasidium japonicum. It is necessary to get rid of of the gills and spray the plant with the appropriate product. Rhododendrons, and among them azaleas, are plants whose roots lack root hairs. Their radical system is formed by kind of a ball, constituted by fine roots that carries out the same function that root hairs carry out in a normal root. 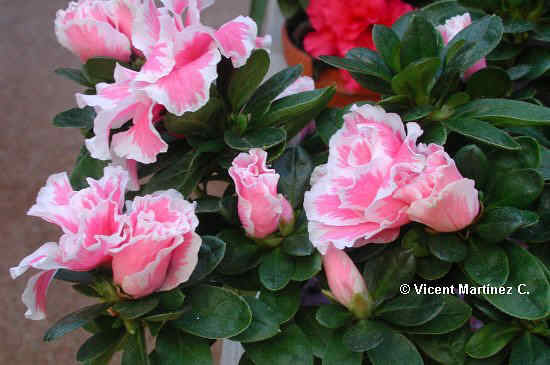 What does this kind of radical system implies in the cultivation of azalea? They lose the humidity quickly. This means that they should live in very humid atmospheres. In gardening it means that they should undergo a very habitual watering. But, if they get stagnant, they rot easily, too. All this means that, if we want the plant to prosper well, we should offer it a soil with very good drainage. They lack the fixation power that normal roots have when a tap root is helped by the secondary ones. When being in the wild, they need to be covered under another plant that protects them of the wind. With the result that rhododendrons, in general, are undergrowth species. At the same time, they don’t go on well with those species with superficial roots that steal them the required humidity. In gardening a good way to respect this characteristic is to place them in a protected place, or to plant them in clumps so as to develop a mutual protection. It is also very interesting to place them under trees that complete the conditions previously seen.